I love the taste of warm gingerbread, especially appropriate during the winter. Cardamom is a wonderfully fragrant spice that goes well with gingerbread. If you don't care for cardamom, you can substitute allspice or cinnamon - not quite as exotic but still amazingly delicious! Preheat the oven to 350°F and grease 12 standard-size muffin cups or line them with paper cups. Cream the butter and brown sugar in a large mixing bowl until light and fluffy. Beat in the molasses, egg, and vanilla. In a small bowl, stir together the boiling water and the baking soda until dissolved. Stir the baking soda water into the molasses mixture. Sift together the flour, cinnamon, ginger, cloves, lemon zest, and salt into a small bowl. Whisk the flour mixture into the molasses mixture until the batter is combined. Spoon the batter into the prepared muffin cups. Bake the cupcakes until a toothpick inserted in the center of one or two of the cupcakes comes out clean, about 20 minutes. While the cupcakes are baking, make the frosting. Cream together the cream cheese and the sugar in a medium mixing bowl until light and fluffy. Add the lemon juice, lemon zest, and cardamom and beat until fluffy and smooth. Chill the frosting in the refrigerator until ready to use. Remove the cupcakes from the oven and allow them to cool for 5 minutes before removing them from the pan. Place the cupcakes on a rack to cool for 30 minutes. 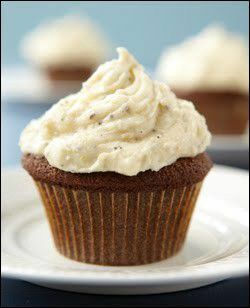 Spread the cream cheese frosting generously over the cooled cupcakes. Reprinted with permission from The Spice Kitchen: Everyday Cooking with Organic Spices by Katie Luber and Sara Engram (McMeel 2009) [Available at Amazon].